solar installers Archives - Solar Love! 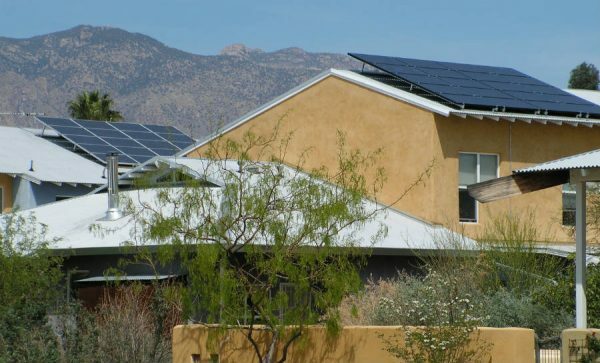 Home Tags Posts tagged with "solar installers"
It’s hard to keep solar down in the sun-loving state of Arizona — folks are happy with their bright spot in the sun and more homeowners than ever are harvesting that golden energy hitting their roofs. 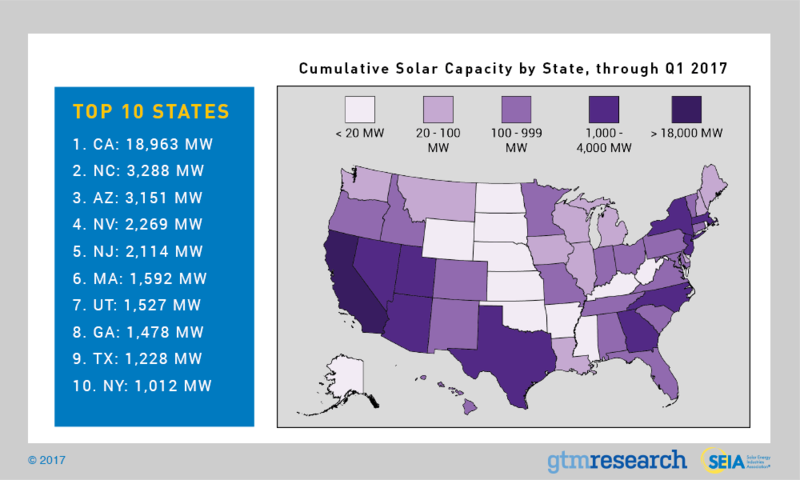 Surmounting some of the worse political challenges to residential solar, Arizona still stands tall among the top US states with the highest solar capacity per capita. So, if you are among the many folks still looking up at your roof and dreaming of clean solar energy powering your home, read on. The following article will help you understand your state’s brilliant spot in the sun and find the best Arizona solar installers to harvest the rays hitting your roof. Topping all other power generating technologies across the US for the first time ever, 39% of all new electric generating capacity was provided by solar energy in 2016. 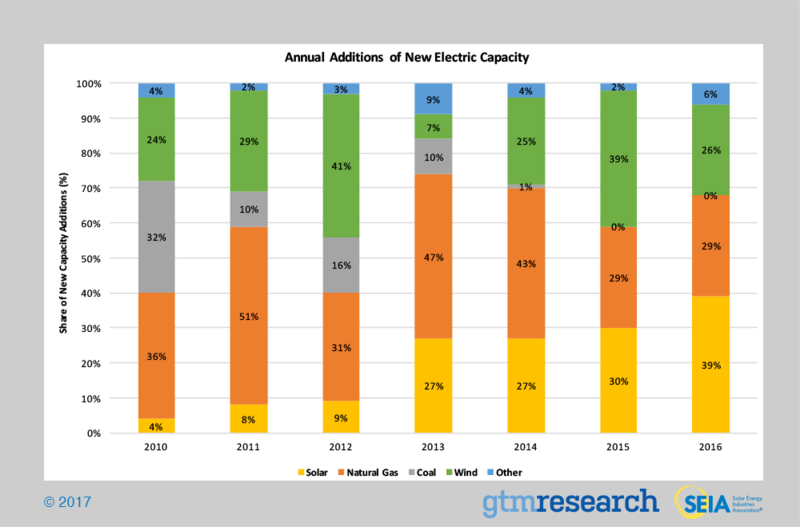 Data for the first quarter of 2017 continued this trend, with 30% of all new capacity installed in Q1 2017 coming from solar energy. There are now nearly 1.4 million solar installations nationwide, representing nearly 45 GW of total solar capacity installed, or enough electricity to power more than 8.7 million homes. The Solar Energy Industries Association (SEIA) predicts this number will reach 2 million solar installations by 2018 and 4 million by 2022. Accompanied by stiff competition and economies of scale, SEIA reports that the cost of installing a rooftop solar system in the US has dropped by more than 70% since 2010. 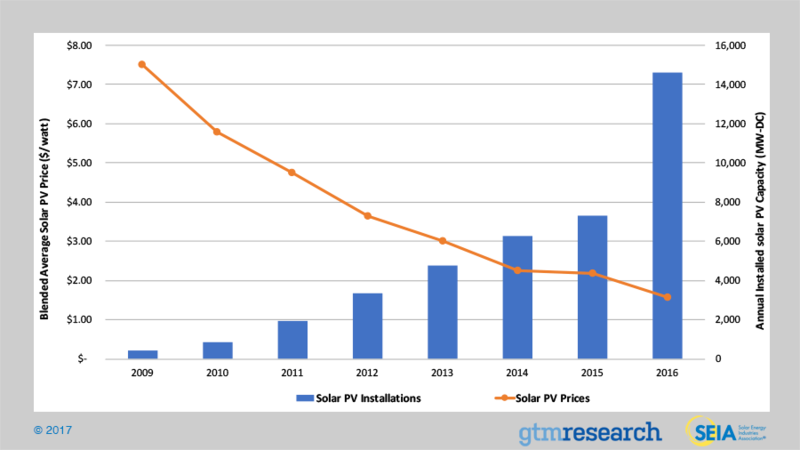 Over the past decade, the average annual growth rate of solar in the US has been 68%, largely spurred by the mobilizing effect of the Solar Investment Tax Credit passed initially in 2006. Arizonans are among the earliest pioneers in the nationwide transition to solar power. With sunshine accompanying Arizonans for about 85% of the year, the huge popularity of solar energy in the Grand Canyon State is clearly a no-brainer. However, joining this long history of solar power uptake in Arizona has been a lot of utility-sponsored pushback, filled with public battles over the value of rooftop solar power generation, the rate (and fate) of compensation for excess generation, and a big fat FBI investigation of APS, the state’s largest power provider, for suspicious political contributions. In spite of all the public turmoil, over $1,109 million was invested in solar over the course of 2016, for a cumulative (and cool) total of $7,777.92 million invested in the Arizona solar market. Fueled by this generous influx, solar installations surged strongly, with Arizona rising to number 3 in the nation, up from 7th in 2016. More than 656 MW were added in 2016, bringing the total installed solar capacity in Arizona to 3,151.3 MW. Nearly half a million homes (469,000) in the state are powered by solar and 5.11% of Arizona’s electricity is “currently” (couldn’t resist) generated from solar energy. Arizona also ranks in the top tier for solar employment, with 7,310 people employed in solar jobs. 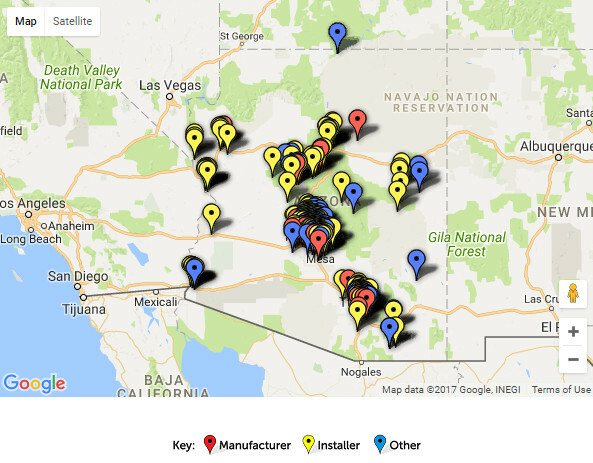 A statewide total of 432 companies support the solar market, comprised of 223 Arizona solar installers/developers, 74 manufacturers, and 127 other solar-related businesses. Among the notable solar installations in Arizona, 100 MW Mesquite Solar 2 in Tonopah, completed in 2015, has enough capacity to power over 14,995 homes. 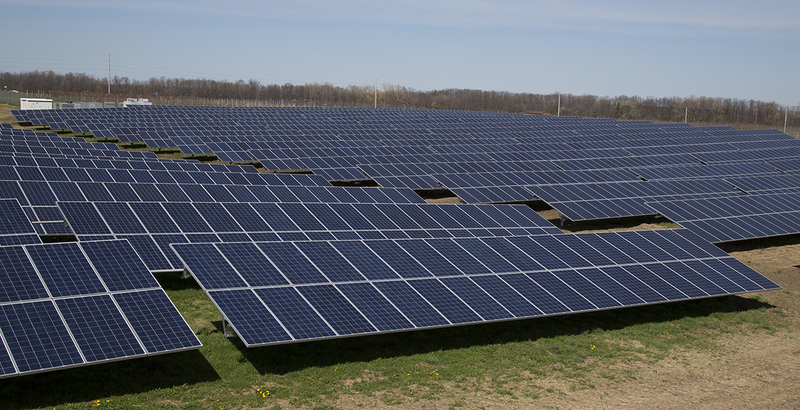 Solana, completed in 2013, has 280 MW of capacity, enough power to plug in over 41,652 homes. Planning a solar plant since 2014, the Navajo Tribal Utility Authority inaugurated the 27.3 MW Kayenta Solar Project in June 2017. This is the first large-scale solar power plant built on the reservation, bringing electricity to many residents for the first time ever. The Navajo Tribal Utility Authority, an entity of the Navajo nation, is now planning additional solar power plants to be constructed on the 300 acres of land under Navajo jurisdiction in Arizona. 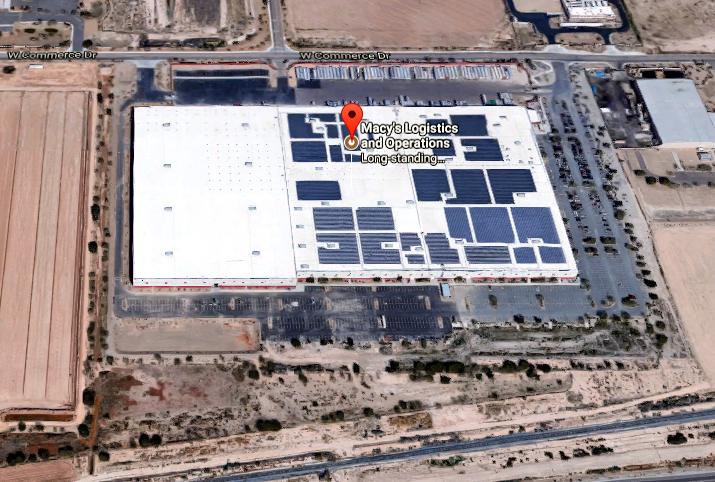 Joining such large retailers as Albertson, Body Sculpting Center, and Bookmans Recreational Exchange going solar, Macy’s tops the list with 3 MW of solar capacity installed on the roof of its logistics and operations center in Goodyear, Arizona. With a 70% decline in cost since 2010, rooftop solar is cheaper than ever and finding the best Arizona solar installers is easier than ever, too. There are a few considerations to keep in mind, however, when you are contacting installers to get a solar quote. The following tips will help guide you to get the most efficient harvest of solar energy for your home. Keep in mind that labor and “soft” costs take up about 50% of a solar installation price tag. Larger solar companies typically spend more on “soft” items, such as major advertising campaigns and other marketing costs, with their customers footing the bills. 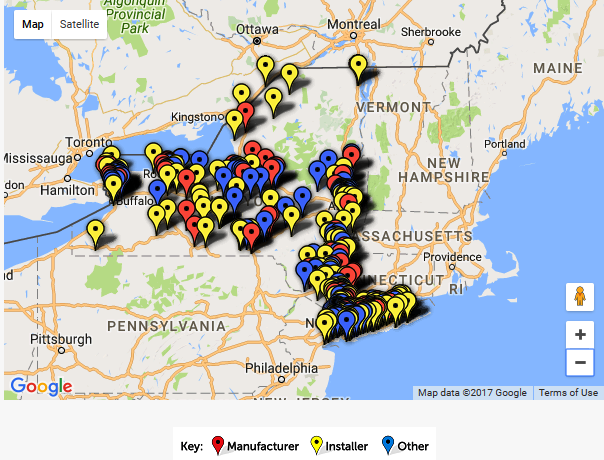 Also, the installer you choose must be completely familiar with all of your local, state, and federal incentives, as well as local permitting and other utility-related rules and regulations. Choose carefully between local and out-of-town solar installers, since local experience, ongoing support, and the honoring of warranties offered can be crucial in both the near term and the future. Every rooftop solar installation is unique, but no matter how you get it done, going solar is a rewarding decision. Harvesting clean, free solar energy to power your home brings a huge sense of satisfaction, knowing that you are part of the renewable energy revolution and doing your part to help protect the environment. The list below is hand-picked to give you a list of the best Arizona solar installers for 2017. Every situation is unique, so this list is not in order by ranking factors which may or may not apply to your case. Listed alphabetically, the following Arizona solar installers represent the best in the market based on reviews and rankings from such sites as solarreviews.com and solarpowerworldonline.com. Although Hawaii is one of the sunniest spots in the US, there are still plenty of empty island rooftops that could be harvesting clean, free solar energy to power the home or business. Featuring all of the rooftop solar information you need to know, the following article gives you state and national data on solar installations, tips for evaluating solar installers, and a great list of the top Hawaii solar installers for 2017. As reported by the Solar Energy Industries Association (SEIA), nearly 45 gigawatts (GW) of solar capacity is now installed nationally. Over 2,044 MW were installed in the first quarter of 2017 — the 6th quarter in a row that has recorded more than 2 GW installed. The annual growth rate of solar is surging at 68% over the last 10 years and has brought a current total of US solar installations to 1.54 million. No matter which state in the nation you happen to be living in, solar prices have dropped an average of 63%. So, if you haven’t installed solar up on your rooftop yet, this is clearly a great time to go solar. In the sunny state of Hawaii, over 188,000 homes are now powered by free, clean solar energy. With a whopping 64% decline in solar prices over the past 5 years, Hawaii solar installers have been very busy. SEIA reports that over 107 megawatts (MW) were installed in 2016 alone, bringing the state total to 748.4 MW. According to the US Energy Information Administration (EIA), Hawaii generated more solar electricity per capita from distributed facilities than any other state in 2015. The EIA also reports that solar energy from both utility-scale and distributed resources generated 35% of Hawaii’s renewable electricity. With 3,194 solar jobs filled in Hawaii’s market, there is still plenty of room for growth. And, with over $258 million in solar investments during 2016 bringing the current investment total to about $2,558 million, solar growth is clearly in the forecast for sun-soaked Hawaii. This is good news for the 126 solar companies on the islands, including 3 manufacturers, 91 solar panel installers/developers, and 31 other solar-related businesses. In 2016, several notable Hawaiian solar installations came online. SEIA notes that Phase I was completed on the Waiawa Solar Project. 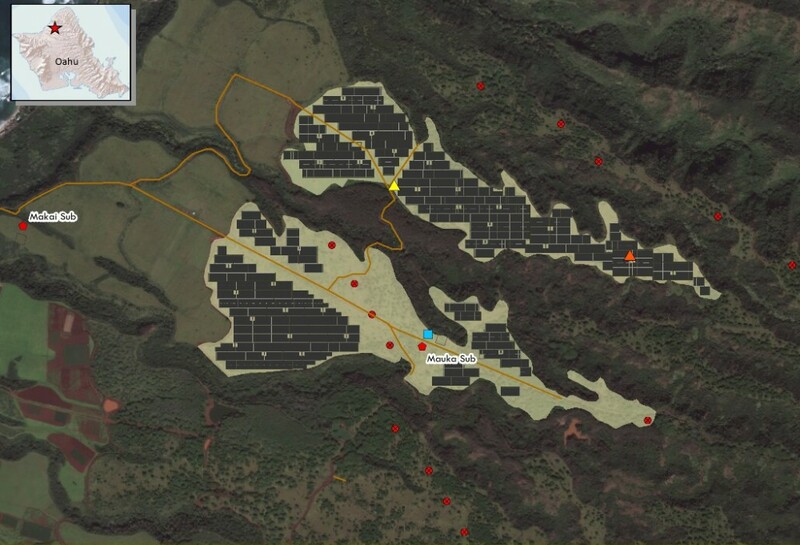 This is Oahu’s largest solar project and NRG recently took over the 50 MW solar installation on lands owned by Kamehameha Schools in Kawailoa on Oahu. The project is scheduled to come completely online in 2019 and bring enough solar energy to power over 12,587 homes in Hawaii. KRS I Anahola Solar, with 12 MW capacity, is also among the larger solar installations in Hawaii, generating enough to power to run more than 3,021 homes. Large retailers in Hawaii that have completed solar installations include Albertsons, General Growth Properties, and Green Growth Properties. SEIA notes that Green Growth installed a 1 MW solar system at its location in Honolulu. Finding the right Hawaii solar installer is easier than ever before. Harvesting clean, free energy from the sun is cheaper than ever before, too. Over the past 5 years, hardware prices have declined substantially, bringing rooftop solar installations into more people’s budget. The labor and other “soft” costs, however, still take up around 50% of the installation price tag. Keep in mind that the larger solar companies typically charge more for installations because they want to cover larger marketing sprees than the smaller solar companies. Ongoing support and warranties offered with your solar installation may be impacted by your choice of a local or out-of-town solar installer. Also, don’t let cost be the final determiner — higher quality products, while more costly, can be the key to getting the biggest harvest of power from the sun. How much electricity did your family use in the last 12 months? Do you have a pool or hot tub, or plan to install these in the future? Do you have or plan to purchase a new EV and plan to install an EV charger? Is your family, and subsequent electricity use, growing? Are you interested in owning or leasing your rooftop solar system? Are you on a tight time schedule for your installation? Your answers to these questions will help guide your evaluation of Hawaii solar installers, covered below, as you are deciding who to hire for your new rooftop solar system. And, with this information, the solar panel installer you choose will be able to help you get the most effective harvest of energy from the sun. The following list is specially curated to provide you with the top Hawaii solar installers for 2017. Please note that the list is in alphabetical order, not in order by ranking. This is because rankings are often based on many factors that may or may not apply to your unique situation. This list is created from sites such as solarreviews.com and solarpowerworldonline.com — all of the links have been hand-checked and represent a great place to start if you are a looking for the top Hawaii solar installers. Although California dominates the US solar market, with 35% market share, there are still many residents of the Golden State thinking about going solar and seeking top solar installers for a new rooftop solar system. The following article features information on the state of solar installations in California, tips to keep in mind prior to calling a solar installer, and the top California solar installers for 2017. 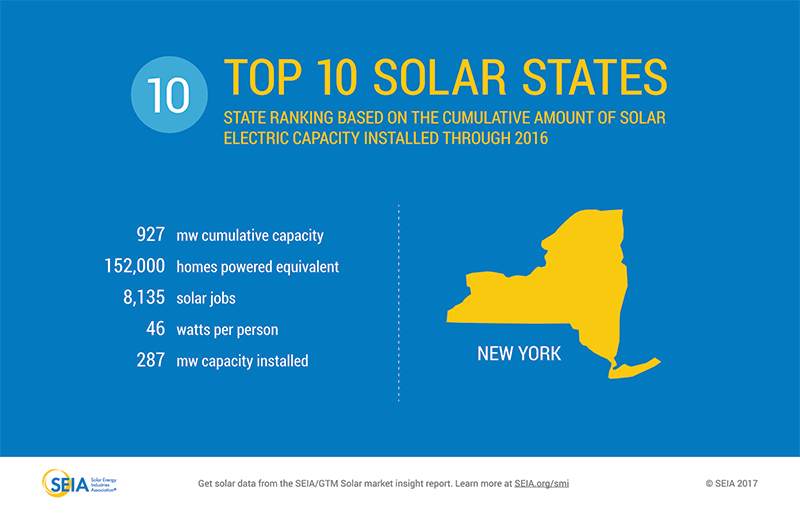 With nearly 45 gigawatts (GW) of total solar capacity now installed in the US, the Solar Energy Industries Association (SEIA) notes that there are now nearly 1.4 million solar installations in the country. In the first quarter of 2017, SEIA reports, 2,044 megawatts (MW) were installed in the US. This is the 6th quarter in a row with over 2 GW installed and continues to fuel the average annual growth rate of 68% over the last 10 years. Across all US solar market segments, prices have dropped 19% over the last 12 months, led by declining costs for hardware. Over the last 5 years, solar prices have dropped a whopping 63%. No matter where you live in the US, this is clearly a great time to consider going solar. California, traditionally the dominant player on the national solar field, claimed a substantial 35% share of the US solar market in 2016. Beating the national average by 1%, solar prices in California have declined 64% over the last 5 years. Taking first place in total megawatts installed, California solar installers added 5,2117 MW in 2016, bringing the current total to 18,920 MW installed. There are nearly 5 million homes (4,885,000) in the state that are powered by solar as of 2017, and solar power is now contributing 13.4% of California’s electricity generation. Also taking first place in solar jobs, SEIA reports that California’s solar market is now employing 100,050 people in a total of 2,625 companies — 1,261 Installers/Developers, 455 Manufacturers, and 870 other related companies. 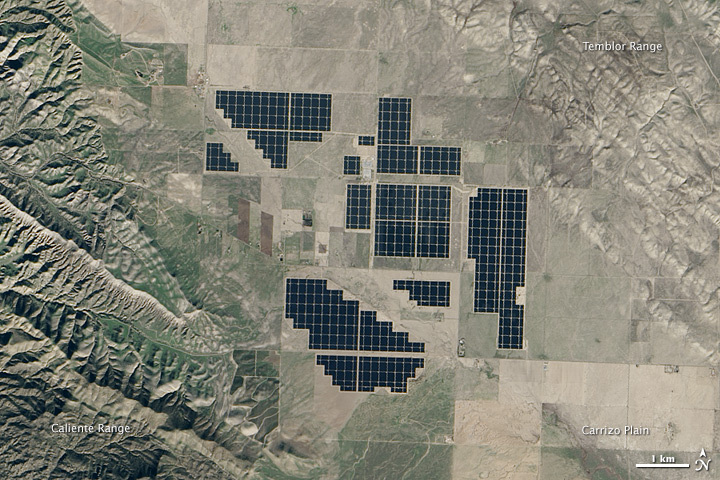 Topaz Solar Farm, one of the largest solar installations in the wolrd, was completed recently in California. It is a 550 MW photovoltaic power station in San Luis Obispo County with enough capacity to power over 142,000 homes in the state. Prologis, the largest owner, operator, and developer of industrial real estate in the US has installed 8 MW of solar capacity at its Rialto I-210 Distribution Center. Another solar PV project, Dulles in Jurupa Valley, has installed 2 MW — enough capacity to power over 516 homes. SEIA also notes that several large retailers in California have recently gone solar in a big way, including AER Worldwide, Agilent Technologies, and Airdrome Orchards. An Earth Observatory image by Jesse Allen, using EO-1 ALI data provided courtesy of the NASA EO-1 team. Caption by Adam Voiland. Over 3,000 hours of sunshine kisses California every year, making the Golden State a brilliant location for generating power from the sun. And, with so much solar power already energizing the state of California, it’s not a matter of “if” but “when” it will become a net-zero state. If you are among the lucky residents considering going solar, consider this: The time is right, the price is right, and finding the right California solar installer is easier than ever. While hardware prices have declined substantially over the last 5 years, labor and other “soft” costs still represent about 50% of a solar installation. In general, the larger solar companies spend larger sums on marketing and will charge more for installations to cover those costs. 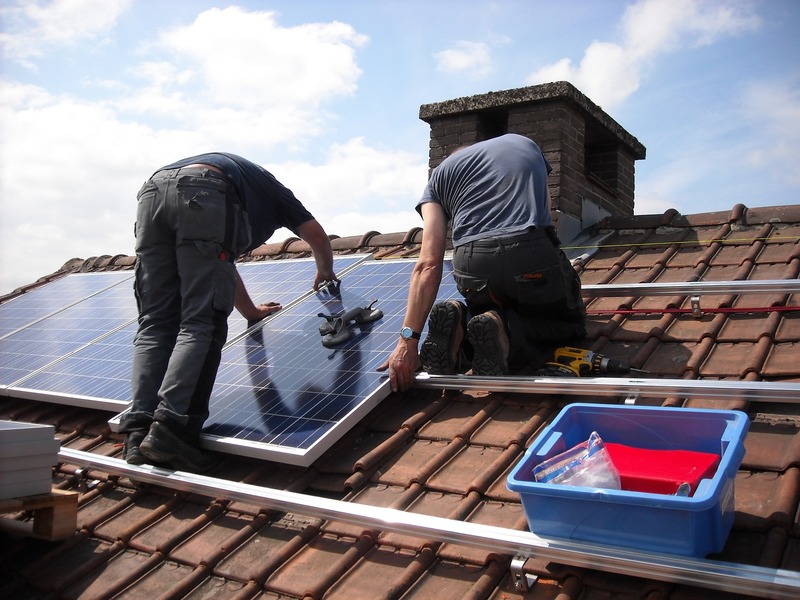 On the other hand, cost is not the only factor to consider when choosing a solar installer. Quality of products used, ongoing support and warranties offered, and the installer’s technical expertise will also substantially impact your future harvest of power from the sun. At the heart of the solar industry, the solar panel installer holds the key to getting you the most effective use of the sun’s energy. Knowing more about the process of installing a rooftop solar system will help you evaluate installers before deciding on who to work with. The following tips will help guide your steps as you review the list of top California solar installers for 2017, covered further below. When a solar installation plan reaches the launch pad, a team of installers arrives at your door, reviews your plan, and seeks access to work areas. This includes access to the roof, attic, electrical panel, garage, etc., as needed. Tools, equipment, solar panels, and related materials will be staged in areas that are convenient for the installers. Equipment and wiring will be installed, the team will clean up and leave, and then you will wait for the city or county inspector to approve the installation. After this, the utility company installs its net meter and gives the official Permission to Operate (PTO). Knowing your current and future electricity usage will help ensure that your solar installation plan covers your household needs. Review your utility bills for the last 12 months, and have them ready for solar installer interviews. Consider how your future electricity needs will grow as your family grows, if you put in a hot tub, or want a solar heater for your pool. And, if you plan to trade your car in for a new EV, you will also want to consider including an EV charger in your solar installation plan right now. Putting all this information on the table when you talk to a solar installer will help guide both of you to better decisions. Understanding the difference between leasing, often via a power purchase agreement (PPA), and owning the solar system installed on your rooftop is very important. There are important reasons why one or the other option may be more appropriate for your individual situation. The technology, in either case, is the same. The main difference is the relationship with the homeowner. Owning your own solar power system comes with the potential advantages of reaping immediate tax credits, paying for itself over time, providing electricity to your home for free, and earning a little cash from selling excess electricity to your local utility. However, owning comes with associated maintenance responsibilities and a steeper upfront price tag, typically around $10,000 or more at purchase. And, without the cash upfront, you’ll need to take out a loan that might ultimately double your price tag. Leasing/PPA options appeal to cost-constrained homeowners because there are typically low or no upfront costs. The solar company owns and maintains the system installed on your rooftop, and you agree to pay a certain rate for the electricity generated for a certain number of years, typically 20 or 25 years. 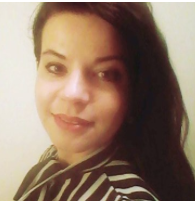 Both before and after the term expires, there are usually terms for buying the system outright, although the price may not be cost-effective and the process may not be straightforward. Your solar installer must know your local regulations, building codes, and permitting processes, as well federal, state, and local tax credits and other incentives. Familiarity with your local utility’s net energy metering program (NEM) is also a must. Finally, once your system is installed, your warranty is crucial and your installer’s distance may impact ongoing support for your solar installation. Seek clear answers from potential solar installers regarding all of these important issues. Although the actual installation doesn’t take long, the time required between choosing an installer and getting your system installed can vary substantially from one installer to another. Some of the larger solar companies can take up to 12 months before your solar panels arrive. The time lapse may be due to installer backlog, unavoidable administrative paperwork, and/or complying with governmental regulations. Always ask potential solar installers for a clear estimation of the timeframe you can expect from them. The following is a specially curated list of top California solar installers for 2017. Please note that this list is alphabetical — it is not in order by ranking because ranks are based on many factors that may or may not apply to your case. Primarily based on positive reviews from sites such as solarreviews.com and solarpowerworldonline.com, this list represents the best place to start if you are a Californian ready to go solar. Veterans and solar jobs make a perfect match, and to underscore that point in honor of Veterans Day, the leading US solar installer SolarCity has produced a video spotlighting a SolarCity Senior Inspections Coordinator and former US Army sniper, Frank Sandoval. In the video, Sandoval makes a great case for the restorative power of work with a purpose, and solar jobs in particular. 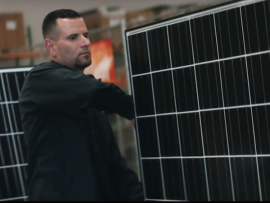 The SolarCity YouTube video tells a compelling story, but it’s not the whole story. CleanTechnica got the inside scoop from Sandoval himself in a phone conversation last week, so we’re happy to fill in (many) more details with the following exclusive interview. I’ll never forget this. I was on top of a house in Pasadena and someone stopped, honked their horn and gave us a big thumbs up because they saw solar panels going up on this house, ran to the store, bought us a case of water, and brought it to us. At that point I knew I wasn’t in your average construction company. I knew that I was going to be a part of something that everybody wanted, and that everybody was embracing. That’s when I started paying attention to what I was actually doing. When I started with this company I thought it was just construction. You know, that doing renewable energy is a different type of construction. So, my mentality was construction. But I didn’t actually realize until that moment that I saw that person. It wasn’t even a customer, it was a random person that had seen us, and was excited about it, and at that point I really started telling myself like what am I actually doing? And then I started doing my own research, and then it kind of blew up from there, as far as my passion. If you really think about it, nobody gets excited about construction. You look at a house being built, and no-one gets excited that we’re construction workers. That was just one [instance]. If I had a quarter for everyone who said, “We’re happy you guys are here in the neighborhood, we’re excited, we’re going to get it ourselves,” or the neighbor says “we’re excited about this,” I wouldn’t have to work. I would be a rich man. As far as the reason why I’m here, it’s not necessarily for the climate change…I’m a big fisherman and hunter, and I notice a lot of resources are being [mis]used, like water is being used to cool down nuclear power plants. I’m a firm believer that we’re not overfishing, we’re overusing the waters. With solar, it stops that. It’s a tool that stops the destruction of our environment. Fossil fuels and things like that really destroy the natural resources that we have. If we can have the same kind of energy without destroying our land, then why not. 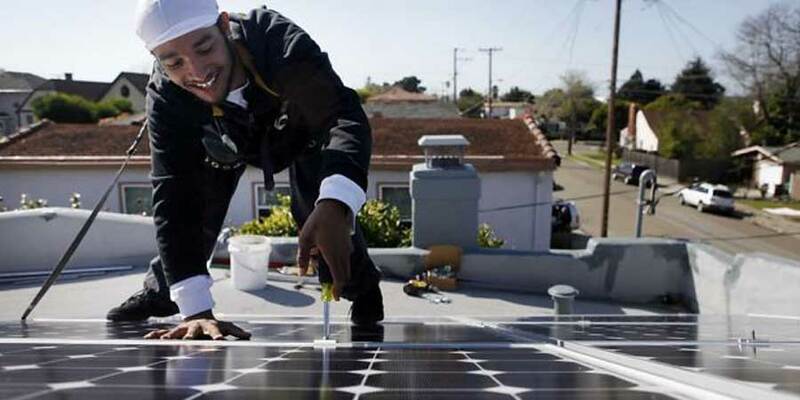 Solar jobs are just one good renewable energy match for veterans. The wind energy industry, for example, also has a great appreciation for the skill set that veterans bring to wind turbine installation and other aspects of that sector. One difference with solar jobs, though, is that today’s active duty service men and women are beginning to come into civilian life with a hands-on appreciation for the uses of solar energy. Before I left, solar was mentioned. It was a different way of using energy, because we were using generators, and these things are loud and obnoxious. You can hear a generator for miles away. A little bit close to the end, the generators started being put away, and solar panels started being used. That was the change that I started seeing in the military. And you know, the military is using a lot of solar for everything. Out in the field, you can get power. You don’t need a generator, you don’t need a fuel truck….all that logistics in a combat scenario, it takes a lot of timing. So if you can put a solar panel, that you don’t have to keeping this thing fueled, to keep giving it power, then that’s a win-win. When you come home, you have a home with SolarCity. You can put down your M4 memories, pick up a drill, pick up a hammer, and start solar memories. Prioritizing ease-of-use for home solar installers, and long-term value for homeowners, a new partnership between Sungage Financial and SMA America is offering innovations in home solar finance. Sungage Financial, a leading residential solar finance platform, is making it easier for homeowners to realize the financial benefits of solar ownership while saving on energy costs at the same time. Offering convenient, flexible repayment terms, the Sungage® Solar Loan does not require a down payment. 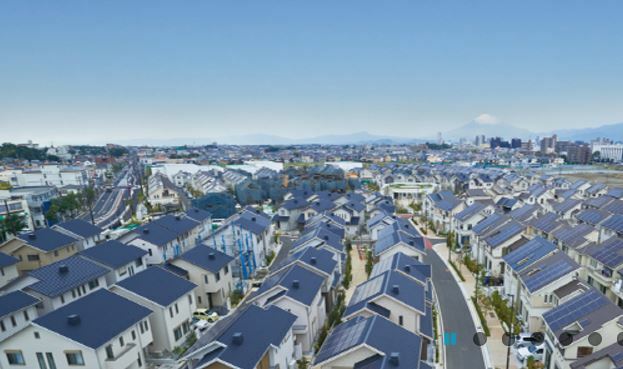 The new partnership pairs Sungage’s simple-to-use home solar finance platform with SMA, the global market leader for residential solar inverters. With a broad product portfolio, SMA offers a compatible inverter for all solar PV system sizes and for every type of solar module on the market.